Food is one of the priority areas of sustainable - or unsustainable - household consumption. To gain clear ideas where specific challanges arise in our nutrition habits is important. Still heated discussions take place which tomato to buy, the one from green houses or the imported one. Instead it is of much higher relevance that the 'dirty last mile' is avoided: not to get the tomato from the shop by car. 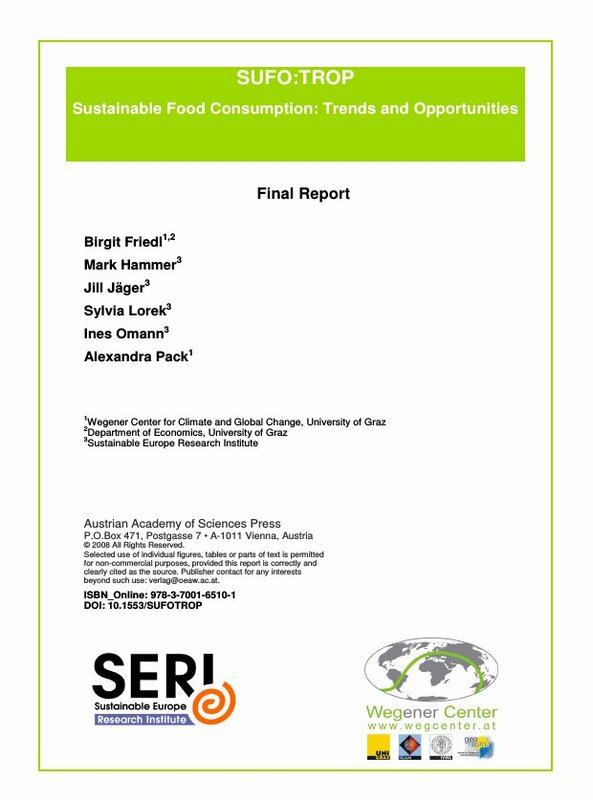 The project ‘Sustainable Food Consumption in Austria: Trends and Options (Sufo:trop)’ focused on food consumption patterns in Austria, and by relating them to economic data from households, it developed policy recommendations related to sustainable food consumption. Thus it contributed to a transition to more sustainable food consumption in Austria through an improved understanding of food consumption patterns and trends and their direct environmental impacts. Policy recommendations were be based on detailed analysis of trends and patterns, as well as a dialogue with stakeholders. The project resulted in the following recommendations. especially beef and dried, salted, smoked meat. Measures that raise awareness and change behaviour, that are given in an appealing way via the media that appeal to the different groups are important. In particular aiming at influencing the behaviour of younger, wealthy people and those in high positions are seen to be a very efficient way of changing the trend. CO2 taxes etc.) to keep their traditional eating habits AND to consume more organic food and less meat. Sylvia Lorek contributed to the project with her knowledge on priority indictors. The project took place under the umbrella for SERI Austria.